At Laptop Mag, we produce the most-comprehensive laptop reviews, with analysis based on a mix of in-depth testing and hands-on experience, usually completed over a period of days. We test hundreds of systems a year, so after one review is published, we usually put the just-tested laptop away and move on to the next one. We posted our full review of the MacBook Pro 15-inch back in June and gave it 4.5 stars, but personally, I still had questions. I’ve been thinking about upgrading from my five-year-old 15-inch MacBook Pro and wondering whether the new model is right for me. While the 2017 MacBook Pro’s clicky keyboard has more travel than its immediate predecessor’s, I didn’t know if I wanted to trade away the keys — which have far more movement and comfort — in my 2012 model. Was Apple’s Touch Bar the tappable gift that the company had promoted, or just a gimmick? I used the new 15-inch MacBook Pro for month to find out. Weighing 4 pounds and measuring 0.61 inches thick, the 2017 15-inch MacBook Pro is lighter and thinner than my personal 2012 model (which is 4.46 pounds and 0.71 inches), but I noticed the thinness a lot more than I noticed the weight, as my bag would feel just as heavy no matter which machine I was lugging. Ports: Is Thunderbolt 3 truly trouble? And let’s just dive right into the MacBook Pro’s Thunderbolt 3/USB Type-C–only policy. Yes, it puts a hurdle in the way of anybody trying to attach a device they already own, because tons of accessories use the boxy Type-A connector. But a small, one-time purchase can solve this issue. Fortunately, because I just wrote up the list of best Type-C hubs, I had my pick of the litter when choosing new a pair to work with. Yes, I needed two hubs, because I use two monitors at work and each of these hubs has only one HDMI-out port. So I had the HooToo Shuttle on one side and the OWC USB Type-C Travel Dock on the other side. At home, I just used Apple’s Type-C-to-USB 3.0 converter cable to connect my 10-port USB hub from Anker to the laptop. Both worked like a charm, and I’d forget I was using them. The biggest innovation in the 2016 MacBook Pro (as well as this 2017 model) is Apple’s sliver of an OLED touch screen, which the company calls the Touch Bar. My reaction? I’m sorry, but I want (most of) my effin Fn keys back. In my whole month with this MacBook Pro, I found that the Touch Bar was mostly an accident waiting to happen. The majority of my interactions with it happened unintentionally; while typing, I would activate the digital Esc key while trying to hit the ` or 1 keys. On the upside, the far right end of the Touch Bar contains a Touch ID sensor, which is my favorite part of the MacBook Pro’s outer body. The convenience it offers, allowing me to unlock my login IDs and passwords from the 1Password utility, is electric, especially when the alternative is typing out my complex, 23-character pass code. Right under the Touch Bar is the most controversial aspect of the MacBook Pro: its clicky keyboard. I read news stories about these keys getting stuckdue to a small amount of dust, but I never encountered that issue myself. Neither did my colleague Michael Andronico when he tested this laptop for its official review. That being said, my feelings about this keyboard are lukewarm at best. Its keys offer more travel than you get with recent iterations of Apple’s 12-inch MacBook or the MacBook Pros released in 2016. But the movement in these keys is still paltry compared to what I find in my 2012 model. This wasn’t a constant problem for me during the month, as I typically write on an external keyboard, so I can view a raised display. Doctors say you should do this to prevent back and neck issues, which I’m already headed for due to a lifetime of sitting in front of screens. But when I brought the MacBook Pro and its shallow keys with me to cover a press conference, I felt the pain of shallow keys. Or, more specifically, my fingertips did, as I repeatedly felt the keys bottom out (hit the bottom of the keyboard earlier than expected). My fingers want more than this keyboard’s mere 0.81 millimeters of depth. And while I managed to file my report from the field, I wasted time correcting the mistakes I made while typing on those keys. Sure, one could argue that I could have gotten used to this keyboard over the span of the month had I forced myself to forgo my typical typing methods. But you shouldn’t have to get used to your keyboard. You’re not paying to adjust your own behavior. One night at home, I ran into a particularly annoying issue with the keyboard. While the caps-lock key itself wasn’t stuck, clicking it wouldn’t stop the computer from spitting out all-caps text. A quick restart remedied the issue. Aside from the introduction of the Touch ID sensor, my favorite upside of this temporary upgrade was the much-needed speed boost. My old MacBook Pro felt like a reliable Honda Accord, but this new laptop was so fast that using it was like driving a high-end Acura with leather seats and a nitrous tank attached to the bottom. Not only could I could open all of the tabs that I wanted (and keep them open, and forget about them until I needed them), but I could also run every single app I could think of, without seeing pauses or problems. That is the benefit, of course, of having a 7th Gen Kaby Lake CPU and a 4GB Radeon 560 GPU, with a strong 16GB of RAM. In particular, I saw massive gains in the speed of video-editing programs (Final Cut Pro X, Adobe Premiere Pro and iMovie). 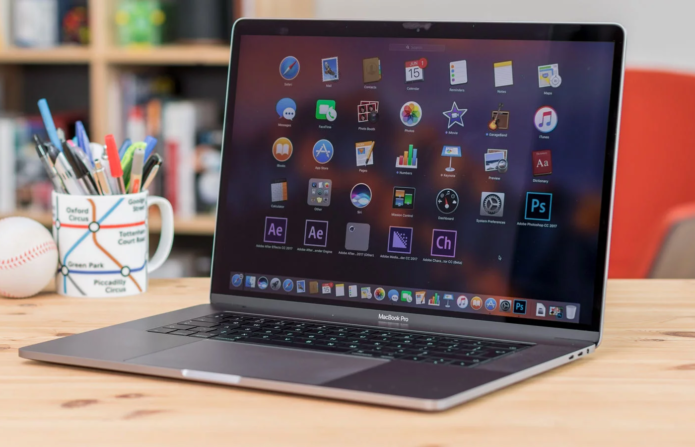 When I tried to run any of these programs or even Apple’s simple iMovie on my old MacBook Pro, I experienced pauses, waits and stutters, which wasted my time and gave me a headache. The modestly demanding side-scroller Cuphead isn’t difficult to run, but to use it in a Parallels virtualization on my personal MacBook, I had to make sure that no other apps were open. But on the 2017 MacBook Pro, I could keep Safari, Tweetbot and the Bear text editor open without hitting slower frame rates. There’s little that I need to say about the sound and picture quality, as Apple continues to hit it out of the park in both areas with the ferocity of slugger Aaron Judge. Footage I shot of an In-N-Out Double-Double Animal Style burger looked incredibly realistic on the MacBook’s Retina display, with popping yellow in the cheese and the background’s blue skies looking serene. St. Vincent’s album “Masseduction” sounded fantastic, with strong bass, clear vocals and accurate synths. My time with the MacBook Pro left me excited … to see what Apple will do next with the line. With this machine’s upgraded performance and fingerprint sensors, as Biz Markie might say, it’s “got what I need.” And I could see the MacBook keeping biometric security and moving it out of the keyboard, now that Face ID is a thing and the company can build security into the webcams. While I’ve learned that Thunderbolt 3/USB Type-C ports are nothing to be afraid of, my time with the clicky keyboard and Touch Bar has convinced me that I shouldn’t rush out to buy this machine immediately. I get why thinner keys and more-lithe laptops are desirable to some people, but I’d rather have a superior typing experience than a svelter system. So, for now, I’m holding onto my 2012 model, and hoping it can stay alive until Apple changes the MacBook’s keys.